Houston Business Journal names UH Law Center alumna Lorick '14 a "Woman to Watch"
Home > News and Events > Houston Business Journal names UH Law Center alumna Lorick '14 a "Woman to Watch"
Sept. 14, 2018 - The local legal community is taking note of Mia Lorick early in her career. The 2014 graduate of the University of Houston Law Center was one of 12 "Women to Watch" as part of the Houston Business Journal's 2018 Women Who Mean Business awards. "I'm so honored to receive this recognition from the Houston Business Journal," Lorick said. "It's an important award for me because I am only in my fourth year of practicing law, and only two of the 12 women selected are attorneys." 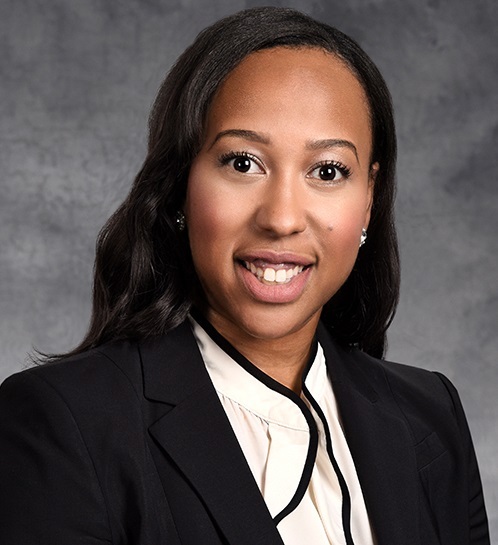 Lorick, an associate at Roberts Markel Weinberg Butler Hailey PC, focuses much of her work on real estate litigation, professional liability, and civil appeals. Since becoming licensed to practice law, Lorick has participated in three jury trials and has had five appellate oral arguments, including oral argument at the Texas Supreme Court earlier this year. "I think my experience stood out to the committee for the Women to Watch awards," Lorick said. "It was my goal to find a firm that allows its associates to be in the courtroom. My firm does not shy away from letting young attorneys handle a hearing, take a deposition, or try a case." Having the determination to become a litigator partially came from Lorick's past a performer. Lorick attended the High School for Visual and Performing Arts in Houston and completed her undergraduate education at the North Carolina School of the Arts. She then relocated to New York where she worked with several modern dance companies. "I'm a performer by nature," Lorick said. "When I went to law school I immediately asked about the tryouts for the mock trial team. I knew that when I began practicing law I didn't want to sit at a desk and draft documents. I wanted the opportunity to be in a courtroom advocating and my mock trial coaches Jacqueline Houlette and Julie Gray prepared me to do just that." Lorick serves as a co-chair for the Law Center's 100% Challenge – a fundraising effort that brings alumni at law firms and corporations and other organizations together for the common purpose of maintaining excellence in legal education at the Law Center. She said having a mentor in Richard Whitely '99, former president of the UH Law Alumni Association, helped encourage her to give back to the Law Center. "Richard is at Bracewell, and to see a Law Center alum who is a partner at a big firm take the time to mentor others inspired me," Lorick said. "It's important to me that UHLC students are getting that same sort of reach back from alums in Houston. I think everyone has a duty that when you're handed a gift like that from mentors before you, you should pass it back." Another way Lorick is paying it forward is by contributing an annual gift to the Law Center that encourages law students to dress the part. The "Suited for Success" scholarship, named after her blog Sharply Suited, will begin this school year. "The Suited for Success Scholarship awards two students per year with a scholarship to buy a suit or business-related clothes," Lorick said. "I want to provide something that will support people in their endeavors to seek employment."